The Main Navigation menu is located on the far left side of the Administration Screen; it contains links to all the major administrative functions within your WordPress site. This Main Navigation bar is visible wherever you are inside the back-end of your site, and gives you quick access to all the work areas, site appearance, and important settings that control your site. Under each tab there is often grouped many other sub-sections (or sub-pages) related to that parent tab heading. You can easily view the grouped sub-sections by hovering your cursor over the major tab, which will reveal a fly-out menu offering direct access to each sub-section. 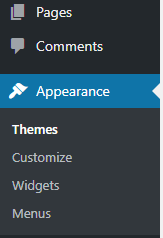 When you are working within any of the major areas, it is displayed as a highlighted blue tab with light text, and the main navigation menu expands to show a list of all the related sub-pages below. Why are my tabs different? You may notice you are missing tabs that you see represented here, when looking at the admin area of your site. WordPress is designed as a multi-user environment, with many different User Roles that can be assigned by the site administrator. If your User Account has a role other than Administrator, you may see a reduced set of tabs in your admin screen.